On the first day of BEA 2013, the word on the floor was to get over to Gretchen McNeil's line for a copy of 3:59. Everywhere I went, people were wearing shirts with the title emblazoned upon their chests. 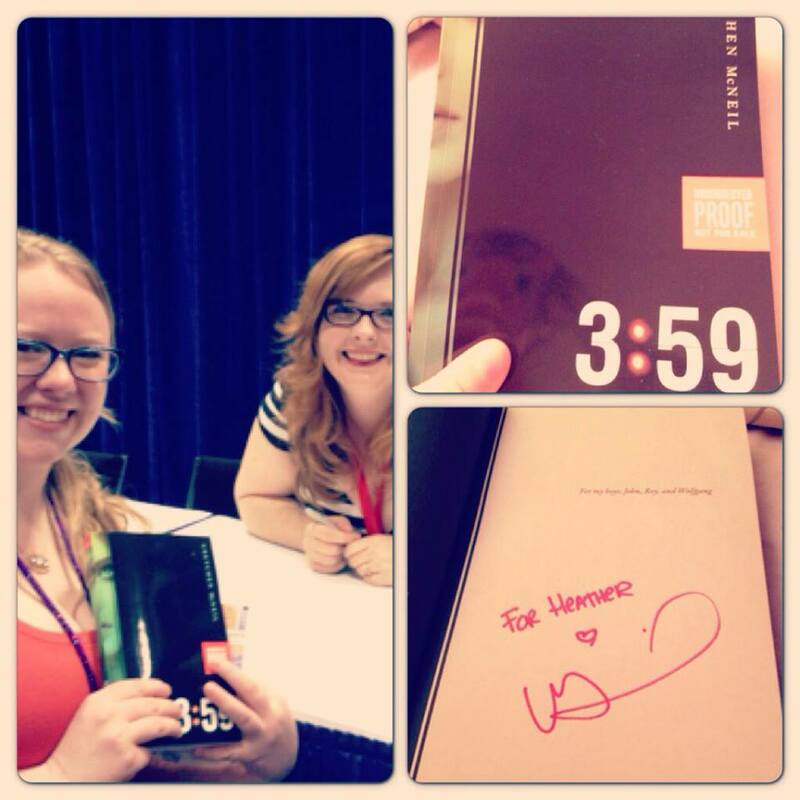 My first day at BEA was a crazy whirlwind, and I'm so glad getting 3:59 and meeting Gretchen McNeil was a part of it. Her book wasn't the first I got autographed that day (it was the second), but it was the first book I absolutely had to read. Once I picked it up, I simply could not stop myself from putting down every other book that I had been reading prior to BEA to dedicate myself to it wholly and completely. 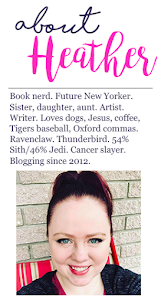 My love for the book shows -- it was in my purse everywhere I went and became my subway book for the duration of my stay in New York City (which went a few days beyond BEA). In fact, I was so engrossed in it one day on the subway that I missed my stop to get off and see the World Trade Center and the new memorial and ended up in Brooklyn. And then, I was so transfixed in it as I was getting back on the subway to get out of the outer borough that I got on a train going in the wrong direction and ended up much deeper in Brooklyn and in a scary area. The good news is that I managed to right myself quickly and hopped off one train, bolted up and then down two flights of stairs to the other side of the tracks and found myself safe in Manhattan once more. The better news? 3:59 was totally worth the short scary moment. The novel is absolutely brilliant. 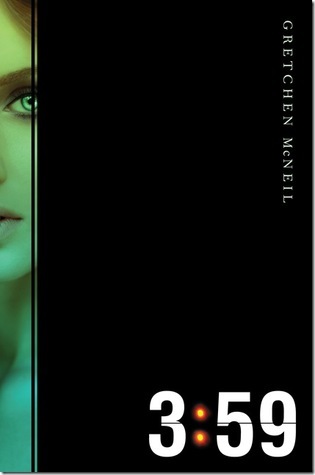 3:59 is the story of Josie Byrne, a high school student whose life has been in a downward spiral of chaos. beginning with a significant change in behavior for her mother (a physicist), which subsequently caused her to divorce her father (also a physicist). The icing on the cake? Her boyfriend, Nick, who has been mysteriously absent and hard to connect with cheats on her with her best friend, Madison. The Byrnes are both scientists who have focused their entire career on theory of parallel universes. Josie herself is also a promising science student. But one day, something extremely strange happens to Josie. After picking up a mirror from her father on her mother's behalf, Josie experiences a blackout of sorts at 3:59 p.m. as she drives home. After that, her life begins to get stranger and stranger. She begins experiencing dreams every night at 3:59 a.m. where she sees a life that is very similar to her own -- where her boyfriend seems to be still in love with her, where here mere presence intimidates her peers, where her life seems very much together. But just like everything in life, things aren't always as they seem. When Josie and Jo, the girl in her dreams and who begins to appear on the other side of the mirror in her room, switch places, Josie finds that she has been the victim of a hoax. The woman that has been living with her is not her mother, but Jo's. The two were switched in a plan masterminded by Jo's mother. Josie's actual mother remains locked in a mental hospital in the world that Josie, too, is stuck in. She remains under the watch of government officials and doctors who don't have her best interest -- or the interest of anyone -- at heart. 3:59 is a truly amazing book, one that has the perfect degree of real world appeal and science fiction, and is a YA novel that is smart, witty, captivating, and entrancing. 3:59 will be available on September 17, 2013.